9 December 2016, at 12:00a.m. 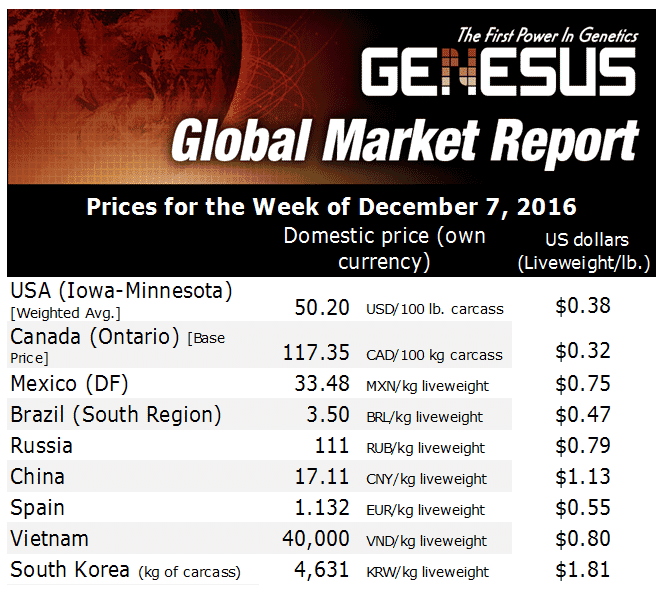 MEXICO - About six weeks ago I reported prices for Mexico with an average of 28.1 MXN pesos/kg (68¢/lb USD) liveweight, a higher average of 16.6 per cent from the same 4 weeks the year before, writes Fernando Ortiz, Genesus Ibero-American Business Development. About six weeks later, Mexico has experienced an even higher market in terms of prices. Mexico City’s pork price has increased by 11.8 per cent, from 28.1 MXN pesos/kg (68¢/lb USD) to 33.16 MXN pesos/kg (74.2¢/lb USD). On the other hand, the average national pork price is not bad at all, going from 27.6 MXN pesos/kg (62¢/lb USD) to 31.98 MXN pesos/kg (71¢/lb USD), a higher average of 11.58 per cent over the last six weeks. Another factor has been the action of the Mexican peso against the American dollar. Two years ago, the Mexican Peso was 12.50:1 against the USD. From then until now, there has been significant dollar revaluation, like most of the other currencies around the world. This week, the US dollar was quoted around 20.25 Mexican pesos, almost 11 per cent devaluation over the last six weeks. This has been positive for the domestic swine industry, as it has avoided a major overflow of American pork to Mexico. We believe that this factor, paired with a relatively expensive American pork, is supporting higher prices in Mexico. The lower value of the Mexican peso, compared to the US dollar, is influencing the import demand of pork being produced in North America. Mexican currency has come under significant pressure against the US dollar. That makes US pork more expensive and is probably having a negative impact (to the US) on the volume of pork exports. It seems that disease factors are also pushing Mexican pork prices higher. It appears that outbreaks of PED and PRRS are raging in several regions of the country, causing considerable losses and negatively impacting hog supply to the market, according to some producers we have talked to. The fact is there is a shortage of pigs in Mexico. We asked ourselves this question last time “How long will this high price last?” and our answer was “We believe not that long.” To be honest, there is a little panic in Mexico about these unusual prices, but the current market situation is a mere reflection of demand and supply. The Canadian government has opened its market to Mexican pork after recognizing Mexico as a country free of classical swine fever (CSF). Mexico has requested recognition of its health status by the Canadian authorities since 2009. Canada is considered a leader in pork products, meaning the achievement is of the highest importance to Mexico.